Fresh from crucial victories, leaders in the fight to "Save the 1,000 acre forest" in Old Saybrook came to Bent of the River Audubon Center in Southbury today to share what they learned about how grassroots environmental advocacy can succeed--even when faced with Goliath-sized opposition. The giant killers have notched big wins recently, including one last month when the Old Saybrook inland wetlands commission rejected a proposal by River Sound Development, a subsidiary of financial services behemoth Lehman Brothers, to build 220 luxury homes and a golf course in an area of Old Saybrook, Essex and Westbrook dubbed by the developers "The Preserve." Discussing formulas for success in environmental advocacy at the grassroots level were (from left) Charles Rothenberger of Connecticut Fund for the Environment, Patty McQueen of Communications Strategies, and Jim Keaney of Alliance for Sound area Planning. 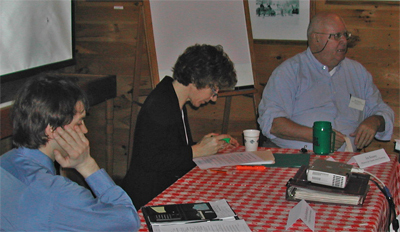 Organized by Sandy Breslin, Director of Governmental Affairs for Audubon Connecticut, the 2006 Advocacy Workshop gave tips about what to do when damaging proposals pop up in their communities, as more are all the time. Among the 30 or so people who attended the workshop, nine were municipal officials seeking to become better informed about how to respond to issues in their hometowns. Several others had previously held government office. 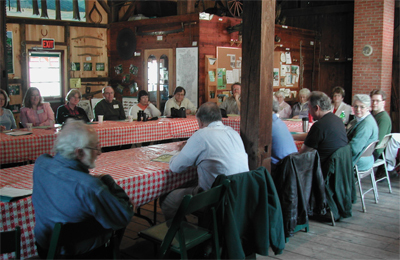 Workshop attendees seated around a table in the barn at Bent of the River Audubon in Southbury. The overall message was to plan, envision a strategy for success, and get the word out. Charles Rothenberger emphasized that town commissions such as zoning & planning or inland wetlands have specific areas of authority, and that it's important for groups to know the difference between issues a commission can consider and rule on, and those that fall outside their authority. Where it may not be reasonable to kill a proposal altogether consider alternatives that might mitigate impacts. Realize that by providing your local boards with expert reports and testimony or alternative ideas you are arming them with the information they need to support your position. Charles offered key insights with regard to how towns can manage the costs of responding to large proposals, and our rights to legally intervene. He said that more and more towns are requiring applicants to pay legal and expert consultant costs that towns must incur in order to evaluate and respond to development proposals by making these costs part of the permitting fee. If your town doesn't have such a requirement, work with your town officials to add it. Charles also highlighted legal rights he said we in Connecticut are very fortunate to have, provided by state statute. The Connecticut Environmental Protection Act, CGS 22a-19, enables you to intervene to become party to a proposed activity that you can show to be "reasonably likely to unreasonably impair the natural resources of the state." This puts you in the loop with regard to important legal information, gives you the right to put on a case in court, and the right to appeal. These are rights Charles said give Connecticut residents a powerful tool that people in most other states do not have. Patty McQueen offered tips on how to conduct media outreach as part of a community campaign, and to understand how newspapers and reporters work. She reinforced the idea that it's critical to focus on a goal, stick to it, and keep things short and sweet. Resist the temptation to get angry or insult people or risk losing all credibility. Above all, speak and write in plain english--language that's easy for anyone to understand. Jim Keaney echoed many of these themes and added what he thought was essential. "There is nothing magical about raising awareness and stopping a huge project," he said. "It's the same doggedness you apply to any effort: 'the harder you work the luckier you get.'"